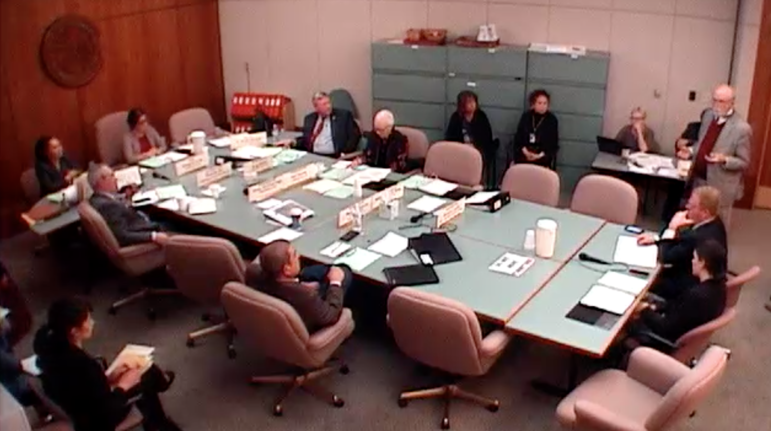 Lobbyist Tom Horan talks to the House State Government, Elections and Indian Affairs committee about why he opposes a lobbyist disclosure bill during the 2019 legislative session. An effort to require more transparency from lobbyists passed its first hurdle in the House. The idea behind HB 131 is pretty simple: lobbyists would report a few weeks after a legislative session ends what bills they worked on, including their position on each bill, if they had one. One of the bill co-sponsors said the measure aimed to help the public have a greater understanding of how policy is made. While new for New Mexico, the requirement that lobbyists report the official actions or specific legislation they attempt to influence isn’t new for many states. At least thirteen require such information, to varied degree. Even more require lobbyists and their employers report the issues or subject matter they’ve worked to influence during a reporting period. The ensuing committee debate on the bill yesterday demonstrated the relationships that New Mexico legislators and lobbyists develop over time. Longtime lobbyist Tom Horan spoke at length during the public comment period about why he’s against the bill, saying it lacked clarity about what bills a lobbyist would have to report. Horan served in the House from 1975 to 1977, and was a lobbyist for the City of Albuquerque by 1978, according to press reports from the time. He carried the bill that created the lobbyist registration act, which passed in 1977, he told committee members. He’s currently registered to represent six clients, including Albuquerque. The bill creates too much opportunity for error, Horan argued, because lobbyists work on many bills and sometimes might talk about bills in passing with legislators without intending to lobby on them. Plus, a lobbyist might simply have too many bills to track for a report, he said. When looking through the bills filed during a session, “about half the bills can touch some part of the city of Albuquerque’s operation,” he said. Rather than a report, have a signup sheet for lobbyists who speak during committee hearings, he suggested. Apparently, other lobbyists who share Horan’s sentiments don’t want to publicly state them. After Horan spoke, Committee Chair Georgene Louis, D-Albuquerque, said she’d heard from lobbyists who didn’t want to give public comments but had been texting her about problems in the bill. Steinborn pushed back on Horan’s suggestions of not having a report at all, saying it was a manageable thing to do. Steinborn and his co-sponsor at the hearing, Rep. Dayan Hochman-Vigil, agreed with two amendments made to the bill. One added more time for lobbyists to file their report, and the other would allow lobbyist to say they took “another position” rather than that they supported or opposed the bill. The rules for when a person has to register as a lobbyist are pretty straightforward. Basically, if a person is compensated–either as an employee of an organization or working as an independent contractor–for attempting to influence legislation or the outcome of a rulemaking procedure, they’re a lobbyist. There are currently 645 lobbyists registered with the Secretary of State, up from 609 in 2018. A little more than a third of the 2018 lobbyists reported spending money, either campaign contributions or expenditures on meals or other items. But all of the registered lobbyists make money, either through a salary or through their work as independent contractors. New Mexico law doesn’t require disclosure of the amount of money paid to lobbyists by their employers. After being amended, HB 131 was voted onward, and is up next in the House Judiciary committee.